Capoeta barroisi also called Zerzuri, is a cyprinid endemic to Hatay region. This fish also inhabit the palearctic region including the Fırat, Dicle and Asi River system as well as those of southern Iran and Syria (Balık and Geldiay, 1999). C. barroisi has an economical value in the Hatay region. The catching of these species are provided by regional fishing gear such as fyke net, traps, hooks and cast nets. Although there are many studies related species of genus Capoeta (Şen et al., 1987; Şen, 1988; Yılmaz 1993; Cengizler and Erdem, 1994; Ekmekçi, 1996; Gül et al., 1996; Yıldırım and Aras 1998; Canbolat et al., 1999; Şen et al., 1999; Yılmaz and Solak, 1999; Turan, 2008; Kara et al., 2010; Yılmaz et al., 2010; Çoban and Şen 2011; Levin et al., 2012; Çoban et al., 2013) several studies are carried out about feeding ecology and growth parameters of this fish species in the River Asi (Sağat et al.1991; Başusta and Erdem 1995; Başusta and Erdem, 1996; Yalçın et al. 2001; Baran, 2004). Such a study will also make it possible to determine the feeding habits of this species in the River Asi. River Asi which is important for East Mediterranean region is a dynamic system in that it not only habitat for many aquatic organisms but it also serves for irrigation. Because a vast agricultural area and many settlements lie along the river there occurs an increase in nutrient salts including nitrogen and phosphorus, thereby prompting eutrophication process. The main objective of this study to determine food preference of C. barroisi which is thought to be fed phytoplankton. Besides in present study gut contents were studied in order to determine the position of C. barroisi in food chain. Therefore Index of Relative Importance (IRI) and Geometric Index of Important (GII) which were relative measuring methods were employed to estimate the dietary significance. The Asi River which is referred to Orontes arises from east of the Lebanon’s Bekaa valley and poured into the Mediterranean from Hatay. The total length of the Asi River is 386 km, a large part of the river is located in Syrian lands. The length of the river in Turkey is 97 km. In terms of the discharge River Asi varies in a year because of severe drought and precipitation. The river is fairly arid in the summer. River discharge decreases less than 2 m3 in a second particularly July and September. The average flow rate is 30 m3\sn. Total water surface is 1.650 ha and drainage area is 22. 300 km2. Afrin and Karasu are the two large tributaries feeds the river besides there are small creeks (Izbırak 1996; Yalçın Özdilek, 1999; Taşdemir and Göksu 2001, Yalçın Özdilek 2006; Anonymous, 2015). This research are carried out in Güzelburç region located at 36o 14.5/ N latitude and 36o 11.6/ E longitude (Figure 1). River temperature ranged from 8oC in March to 30.5 oC in August. Dissolved Oxygen, temperature and PH were measured. Nitrates and soluble reactive phosphorus were analyzed with spectrophotometer. Güzelburç River flows through on muddy area. There are pebbles of different sizes (0.25 cm- 0.5cm) in the river bottom. African Catfish is the most captured between fishermen in this region. Besides European eel and some cyprinids such as Barbus spp., Carasobarbus luteus, Garra rufa and C. barroisi are caught local fisherman. Samples of Capoeta barroisi were collected from February 2002 to January 2003. In the study, a total of 137 individual were analyzed. Collected fish were quickly dissected and that intestines were placed in 4% formaldehyde solution. In addition, gut contents were stored in 4% formaldehyde solution with borax. Volumes of gut contents were measured with replacement method in a burette which is graded in 0.01 divisions. In this study, gut contents were identified to the lowest taxa. Food items were identified and counted with stereo microscope (magnification 100x). The counting was made using Thoma slide square. Defining of food items were made by according to Prescott (1951), Ward and Whipple (1959), Krauter and Streble (1968), Patrick and Reimer (1975), Lind and Brook (1980), Foged (1981), Korshikov (1987), Lund and Lund (1995). Number: the number of each food items in all the guts Volume: the volume of each prey item in all gut in the sample. The relative measures were used to estimate the diet performance for this species by the help of three compound indices index of relative importance (IRI). Geometric Index of Importance (GII) and SI (Selectivity index). The IRI was determined as: (V+N)*F (Hyslop 1980, Rosas-Alayola et al. 2002). Where (V) is the percentage of volume for each food item. N is the percentage of quantity; F is the frequency of occurrence of each food item. The GII was indicated as: F+N+V\ n (Assis, 1996). Percentage of frequency of occurrence for food items (F), percentage of quantity (N), percentage of volume (V), the numerical of gut which filled (n) are shown with this equivalent. The SI was determined as Vf \ Va (Ricker, 1971). Where Vf is the percentage of volume for each items in gut contents and Va is percentage of volume for each items in area. A total of 137 C. barroisi were captured by electroshocking, fyke net and analyzed. It was observed that which were studied full part of 92.70% with a small proportion of empty intestines. Percentage of gut fullness decreased on August (86.67%). The volumetric diet composition of C. barroisi was found Chrysophyta (66.9%), Cyanophyta (19.21%), Chlorophyta (7.27%), Protozoa (0.52%), Xanthophyta (0.02%), Ciliata (0.1%). Pyrrhophyta (0.06%), Euglenophyta (0.02%). In alimentary canals, Dactylococcopsis sp. were dominant species however IRI and GII values of Cyclotella spp. were found the most amounts (Table 1). According to values of GII and IRI the most preferred food items were Chrysophyta while Cyanophyta were important second place for GII. Table 1: Examined fish amounts and some physical-chemical properties of the environment. Preferences of food organisms whose IRI and GII value are high were estimated in these indexes. These indexes include preference rates of food organisms with high IRI and GII value. Out of in this index only Cyclotella was estimated as the preferred food. Another important factor about food consumption is the diversity of the gut contents in different size fish, which will in turn provide us with an idea about the intra specific food competition of a population, C.barroisi was mainly in the 10.5cm-24.8cm total length size class. The food preferences of C. barroisi in different size groups are presented in Table 2. It was observed that every size groups were preferred species belonging to Cyanophyta. According to values of IRI. Chrysophyta members were an important group except that length 18.5cm-20cm although values. IRI and GII were highly rate for these size groups. Besides Chlorobotrys sp. were frequently found in the gut contents of C. barroisi between 21.7cm and 23.2 cm. In addition Nitzschia spp. were found important rates for 10.5 cm- 12.0 cm. Dactylococcopsis sp. and Oscillatoria sp. were preferred every each size groups. Table 2: Gut fullness conditions according to the seasons and months. The relative contribution of total prey abundance, frequency, IRI and GII index of prey classes in different seasons are demonstrated in Table 3. This is considered to be the reason which enhances food diversity. With a view to determine more accurately the feeding periods of C. barroisi priority of food organisms were estimated according to seasons Percentage of occurrence and numerical food organisms for C. barroisi in season are given in Table 4, Chrosophyta species exhibit a higher number in both the summer and the winter. The number of Cyanophyta species increases in both the spring and autumn. 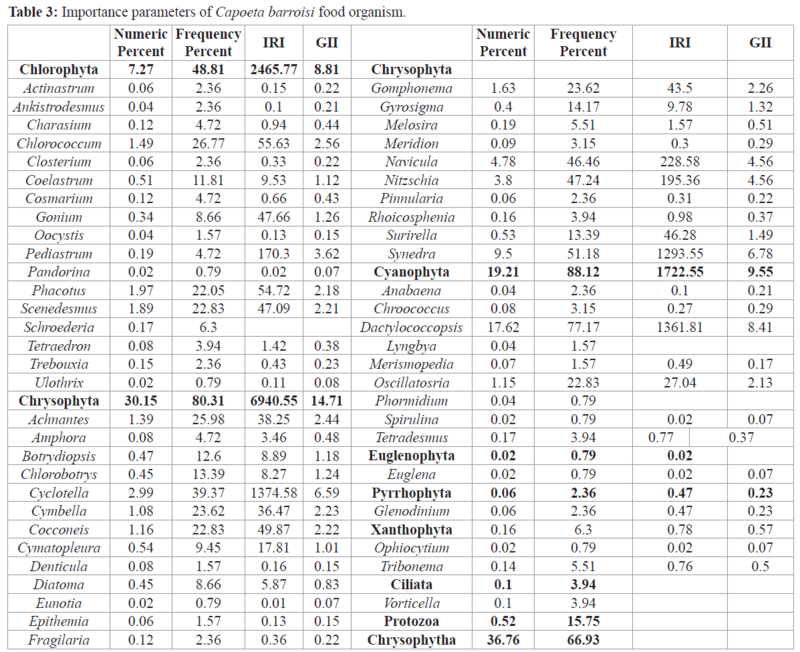 Table 3: Importance parameters of Capoeta barroisi food organism. Table 4: IRI and GII index of Capoeta barroisi food organism. Although Chrosophyta members were taken high proportions in summer and winter. Cyanophyta members contributed a greater proportion of prey abundance in spring (Table 4). Achnanthes sp. Cyclotella spp. Chlorobotrys sp. Chlorococcum sp. Dactylococcopsis sp. Oscillatoria sp. Surirella spp. Synedra sp. and Protozoa species were taken part considerable food items for C. barroisi throughout the year. In addition. Protozoa and other organisms were observed in almost length groups however they were found to be rather low in order to define food preferences of C. barroisi. Percentages of food organism in the river were compared with those in fish stomachs. It was observed that though quantitative of Pandorina sp. which were found in gut contents diminished quantities of Cosmarium sp. and Scenedesmus sp. decreased an important proportion. This research provides food selection, food availability of C. barroisi. Thus this data indicated that; this species demonstrated feeding behavior of herbivorous. Because the diet of C. barroisi was primarily of plant origin except a few protozoa. Parallelly, C. barroisi has filtering feature on sedimentary creatures. Accordingly Chrysophyta and Cyanophyta were the primary group ingested, especially Cyclotella spp. were chosen by C. barroisi. Chrosophyta members have an essential place in IRI and GII index. Dactylococcopsis is the major food organisms among other Cyanophyta members. Şen et al. (1987) ; Yilmaz and Solak (1999) also state that some species of the genus Capoeta feeds on bentic algae for example Capoeta trutta. 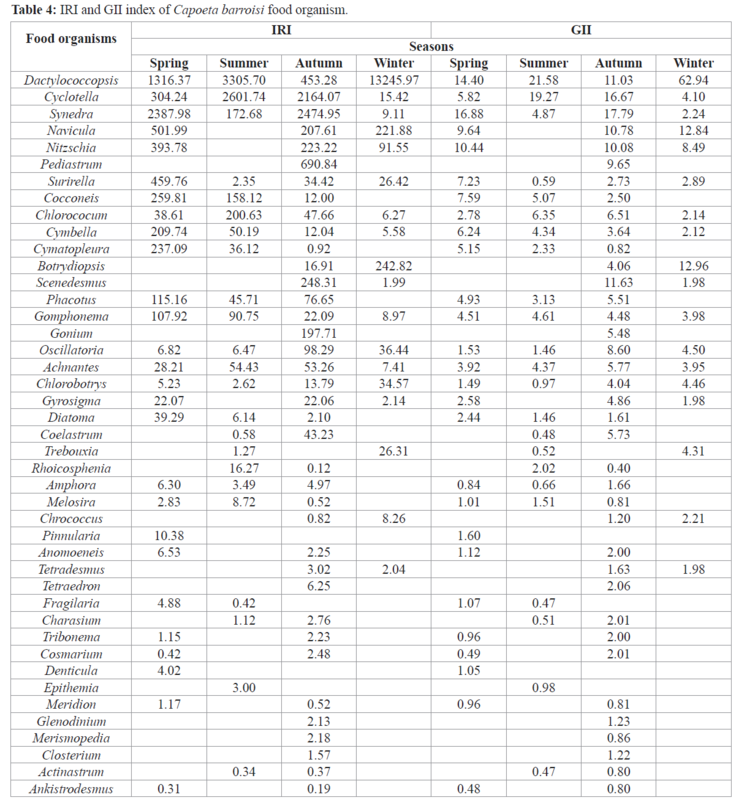 As can be seen in Table 4, food diversity increases in summer months while it decreases to the lowest value in autumn. The reason for the higher diversity in the summer is the increase in the number of species belonging to Chlorophyta and Cyanophyta. It is reported that being accustomed to higher temperature these species multiply in number (Cirik and Gökpınar, 1993). Temperature drops in the autumn is relatively slow compared with the increase in water temperature in the summer. Because of high temperature occurrence of flood and high rate of nutrients into the river via sewage and waste materials result in abundance of Cyanophyta and Chlorophyta. Therefore, Cyanophyta members were more abundant in autumn than spring. In autumn the water temperature relatively high (25oC) which was found to be close to the water temperature in summer. Besides, the same researchers have pointed out that several species of Chrosophyta prefer low temperatures. Also in this research the highest point of diversity was observed during winter months. This is considered to be the factor which enhances food diversity. It is known that periphytic algae are abundant in organically enriched wastewater discharges into a river (Dyer et al. 2003). Such liquid wastes as explained above discharged into the river cause notable algae growth which in turn leads to eutrofication (Haslam, 1995). In parallel, many researchers have reported that Nitzschia palea is an organic pollution indicator in waters which are rich in domestic and organic waters (Khan, 1990, Kelly, 1998, Soininen, 2002). That species are in high ratio may denote that river is contaminated with to freshwater. Therefore. C. barroisi has important role in reducing this unfavorable circumstances by consuming the algae in the Asi River. Because these negative conditions were compensated for and were converted into matter and energy by C. barroisi as a ring of the food chain. It is determined that C. barroisi take place for a constructive role in the ecosystem of River Asi. Therefore, whether C. barroisi can be used as a biologic agent in negative conditions such as algal bloom in various aquatic systems should be investigated. Cyanophyta members like Oscillatoria spp. have toxic effects on fish and on other organisms taking these toxins as a food. It could not be known exactly if there are any toxic algae in C. barroisi gut contents and this could be the aim of another study to solve a noteworthy issue that whether Oscillatoria spp. in the Asi Basin are toxic or not and if toxic how this affects life of C. barroisi. Besides C. barroisi shares its feeding habitat with species such as Barbus luteus, Lisa abu, Garra rufa, Anguilla Anguilla, Clarias gariepinus and Cobitis levantina and some members of Balitoridae family Nemacheilus namirii, N. hamwii (Krupp and Schneider, 1989;1991; Yalçın, 1997). Since Asi River is the main river of Orontes basin drains to the Levant coastline building up a bridge between Mesopotamia and Arabic regions of the Mediterranean. 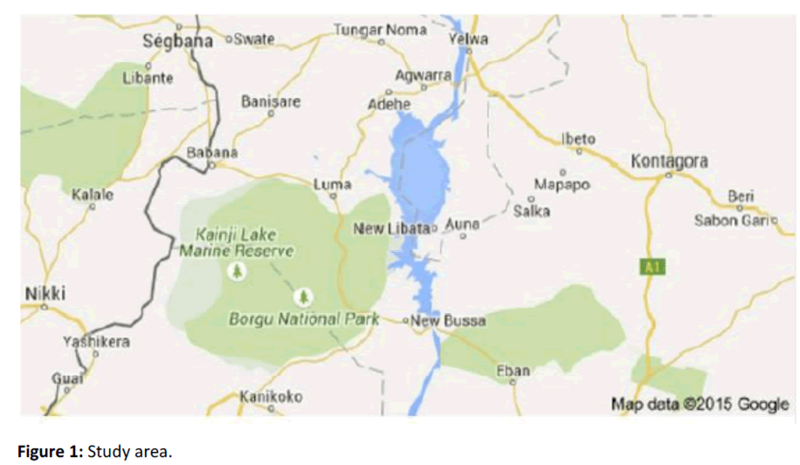 This region plays an important role as the means of biodiversity and zoogeography. Unfortunately, a serious problem water scarcity particularly during summer months due to various dams exists in the basin. In addition to high evaporation water withdrawal from the river groundwater for agricultural production in both Syria and Turkey drastically decreases the river water discharge resulting in drying up some of the tributaries in arid summer season. Furthermore, the Asi River is polluted with all types of wastes that are caused by agrarian industrial and urban activities including cities such as Hama and Humus in Syria and Antakya in Turkey which are notably densely populated urban areas (Özdilek, 2003). Therefore, C. barroisi could be used for cleaning the river environment. All these contaminants may concentrate on the river bed sediments during dry seasons. These immense factors have an effect on the aquatic living resources, such as African catfish, in the Asi basin during dry season (Yalçın et al. 2001; 2002). This is usually associated slowing down effect of the antibiotic so called Pandorinin which is secreted by Pandorine on the development of the Scenedesmus and Cosmarium. This phytoplankton is known as indicators to organic pollution. Among the preferred foods of C. barroisi are also toxic species which are regarded as pollution indicators. Due to domestic and industrial wastes. Although due to domestic and industrial wastes the balance of medium deteriorates in view of nutrient salts such as N, P, Si, Ca. Certain species adapting themselves latest condition start rapidly reproducing. In conclusion, it is important that features of C. barroisi an endemic species such as reproducing growth and population dynamics be investigated to build up data on this subject. This is also valid for other Capoeta species in the region. Furthermore, more detailed facts on the ecology could be obtained by investigating feeding habits of dominant species. A study to be made on C. barroisi and other Capoeta species both River Asi and its tributaries will shed light on the ecosystem of the River as well as other primary data. It was observed that this organism was preferred not intentionally but due to its abundance in the medium. No such an important difference appeared to be between length groups in food organisms of C. barroisi. There seems to be no remarkable distinction among length groups as to frequency of occurrence or percentage of number in food organism of C. barroisi. No other species but Cyclotella was chosen by C. barroisi in the preference index. Therefore, it is considered that C. barroisi didn’t prefer food items from the river. Not on the bases of preferences but only filtering them. Assis, C. A., (1996). A generalized index for stomach contents analycis in fish. Scientia Marina 60(2-3):385-389. Balık, S., Geldiay, R., (1999). Freshwater Fishes of Turkey. Ege University Press. 532p, İzmir. Baran, S., (2004). Gut Contents and Diet Preference of Capoeta barroisi (Lortet, 1894) inhabiting Asi River, Turkey. Unpubl. Thesis, 56p. Mustafa Kemal University Institute of Science, Antakya. Başusta, N., Erdem, Ü., (1995). Investigation of Growth Performance of Capoeta barron Type Living in the Aslantaş and Mehmetli Dam Lake. Symposium of Eastern Anatolia Region Fisheries, Erzurum. Başusta, N., Erdem Ü., (1996). Investigation of Growth Performance of Capoeta barroisi (Lortet, 1984) Living in the Aslantaş and Mehmetli Dam Lake. Doğu Anadolu Bölgesi I (1993), ve II (1995) Su Ürünleri Sempozyumu, Erzurum, 672-681. Canbolat, A. F., Yerli, S. V., Çalışkan, M., (1999). The investigation of growth parameters of Capoeta capoeta (Guldenstant, 1773) in Çıldır Lake (Ardahan, Kars). Turkish Journal of Zoology, 23(EK1), 225-232. Cirik, S. and Cirik Ş. (1989). The planktonic algae of Gölcük. İstanbul University Journal of Fisheries & Aquatic Sciences, 3(1-2): 131-150. Cirik, S., Gökpınar, Ş., (1993). Information and Culture of Plankton, Ege University Press, 280 p, İzmir. Çoban, M. Z., Gündüz, F., Demirol, F., Örnekçi, G. N., Karakaya, G., Alp, İ. T., (2013). Population dynamics and stock assessment of Capoeta umbla (Heckel, 1843) in Lake Hazar, Elazığ, Turkey. Turkish Journal of Fisheries & Aquatic Sciences, 13(2): 221-231. Foged, N., (1981). Diatoms in Alaska, A.R. Gantner Verlag K.G., 317 s, Germany. Gül, A., Yılmaz, M., Solak, K., (1996). Growth parameters of Capoeta trutta (Heckel, 1843) living in Fırat River Tohma waters. Turkish. Journal of Zoology, 20: 177-185. Haslam, S.M., (1995). River Pollution: An Ecological Perspective. 253p.England: John Wiley and Sons. Hyslop, E.J., (1980). Stomach Contents Analyzes. A review of methods and their application. Journal of Fish Biology, 17: 411-429. Izbırak, R., (1996). Turkey I. Istanbul: Ministry of Education Teacher Books Series. (In Turkish), 456. Kara, C., Alp, A., Şimşekli, M., (2010). Distribution of fish fauna on the upper and middle basin of Ceyhan River, Turkey. Turkish Journal of Fisheries & Aquatic Sciences, 10: 111-121. Korshikov, O.A., (1987). The Freshwater Algae of the Ukrainian SSR. Bishen Singh Mahendra Pal Singh and Koeltz Scientific Books, 624 p, India. Krauter, D., Streble, H., (1968). Das Leben İm Wassertropfen Mikroflora and Mikrofauna Des Sübwassers, Gesellschaft der Naturfreunde Franckh’sche Verlagshandlung, 400 p, Stuttgart. Krupp, F., Schneider, W., (1989). The Fishes of the Jordan River drainage basin and Azraq Oasis. Fauna of Saudi Arabia, 10: 347-416. Krupp, F., Schneider, W., (1991). Two new species of Nemacheilus Bleeker, 1963 from the Orontes River drainage basin of Lebanon, Syria and Turkey (Pisces: Osteichthyes: Balitoridae). Senckenbergiana Biologica, 17: 23-24. Lind, E.M., Brook, A.J., (1980). Desmids of the English Lake District. Freshwater Biological Association Scientific Publication, 320 p, England. Lund, H.C., Lund, J.W.G., (1995). Freshwater Algae, Biopress Ltd, 526 p, England. Özdilek, H.G., (2003). The Discharge contamination profile of the Orontes River water quality in Boron example. Turkish Journal of Aquatic Life, 1(1): 176-182. Patrick, R., Reimer, C.W., (1975). The Diatoms of Exclusive of Alaska and Hawaii, Volume 2. The Academy of Naturel Sciences of Philadelphia Library of Congress Catalog Card, 325 p, Philadelphia. Prescott, G.W., (1951). Algae of The Western Great Lakes Area with An Illustrated Key to The Genera of Desmids and Freshwater Diatoms, Department of Botany and Pathology Michigan State University,402 p, USA. Rosas-Alayola, J. A., Hernandez-Herrera, F., Galvan-Magana, F., Abitia-Cardenas, L.A., Muhlia-Melo A.F., (2002). Diet composition of salifish (Istiophorus platypterus) from the southern Gulf of California, Mexico. Fisheries Reserach, 57, pp. 185–195. Şen, D., Polat, N., Ayvaz, T., (1987). Ingredient of the Digestive System of Capoeta trutta living in Keban Dam Lake. Journal of Veterinary Medical Elazığ Region, 2 (2-3): 53-58. Şen, F., Çetinkaya, O., Elp, M., (1999). A study on the fish population Capoeta capoeta (Guldenstaedt, 1773)in Nazik Lake (Ahlat-Bitlis) X. National Symposium of Aquaculture, Adana, 465-475. Soininen, J., (2002). Responses of epilithic diatom communities to environmental gradients in some Finnish Rivers. International Review of Hydrobiology 87, 11-24. Taşdemir, M., Göksu, Z. L., (2001). Some of the Asi River Water Quality properties. Journal of Ege University Fisheries Faculty, 18 (1-2): 55-64. Turan, C., (2008). Molecular systematics of the Capoeta (Cypriniformes: Cyprinidae) species complex inferred from mitochondrial 16S rDNA sequence data. Acta Zoologica Cracoviensia, 51A: 1-14. Ward, H.B., Whipple, G.C., (1959). Freshwater Biology, John Wiley and Sons, Inc, 1248 p, USA. Yalçın Özdilek, Ş., (1999). Some Biological Parameters of Clarias gariepinus founded in the Asi River Basin. Gazi University Institute of Science and Technology, PhD thesis, 179 p.
Yalçın Özdilek, Ş., 2006. Preliminary Data on the Diet of Garra rufa (Cyprinidae) in the Asi Basin (Orontes), Turkey. Cybium, 30(2): 177-186. Yalçın, Ş., (1997). The Fish Fauna of Asi River and Related Waters, IX. National Aquaculture Symposium, September 1997, Eğirdir Isparta, Turkey, pp.73-80. (In Turkish). Yalçın, Ş., Akyurt, I., Solak, K., (2001). Stomach contents of catfish (Clarias gariepinus Burchell, 1822) in the River Asi, Turkey. Turkish.Journal of Zoology, 25; 453-460. Yalçın, Ş., Solak, K., Akyurt, I., (2002). Growth of the catfish Clarias gariepinus (Clariidae) in the River Asi (Orontes), Turkey. Cybium, 26(3): 163-172. Yıldırım, A., Aras, M.S., (1998). Some Reproduction Characteristics of Capoeta tinca (Heckel, 1843) Living in the Oltu Stream of Çoruh Basin. Turkish Journal of Zoology, 24: 95-101. Yılmaz, F., (1993). Food and Nutrition Type and Change by Age in Months of Capoeta trutta (Heckel, 1843) living in the Tigris River. Master Thesis, Gazi University, 58, Ankara. Yılmaz, F., Solak, K., (1999). Nutrition Transition organisms by Month and Year of Capoeta trutta (Heckel, 1843) living in the Tigris River. Turkish Journal of Zoology, 3: 973-978. Yılmaz, S., Yazıcıoğlu, O., Yılmaz, M., Polat, N., (2010). Lengthweight and length-length relationships of Capoeta sieboldi from Hirfanlı Dam Lake, Turkey. Journal of Freshwater Ecology, 25: 205-209.